Robot Snow Removal | FuturePrize | What Does the World Need? It's even a health threat. It doesn't seem like something we should still have to do in 2018. Why can robots vacuum our floors but not clear our snow? Looking closer at the problem, it's actually a pretty tough engineering challenge. You can't simply "roboticize" a gas powered snow blower because of the obvious safety issues. Any autonomous snow removal system would need to be a lower powered solution, not much bigger than the robot vacuums that are now popular in houses. But snow removal is tough, energy intensive work. How could a battery powered robot pull it off? The key would be to operate continuously during heavy snowfall in order to prevent snow accumulation, by a constantly moving robot or robots. These robots would only be dealing with, at most, an inch or so of snow at a time, which should allow a much less powerful system to work. The actual snow removal could be achieved through either a heating element, brushes, or a low powered blower. Running continuously during a snowstorm could use up a lot of energy, so the robot would probably need two or three hot-swappable batteries that would be charging at a base station while the robot is in operation. When a robot is then running low on power, it can go back to the base station and have its battery swapped for a fully charged one automatically. The base station could also hold snow salt (a bit like a grain silo) so that the robot could spread it over the cleared areas in order to help melt ice. 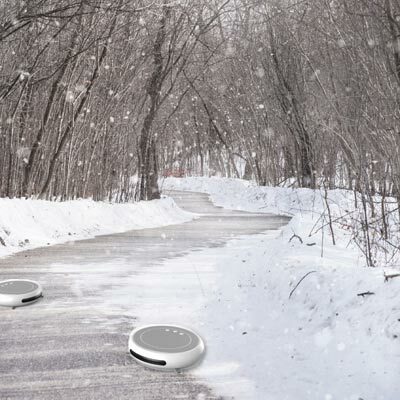 Unlike a robot vacuum, a snow removal robot would be operating out in the real world, so it would need more sophisticated programming for object avoidance and to give humans the right of way. It would probably also need a flasher or some other well-lit signage to alert people to its presence. Its sensor system would also need to be able to tell it whether or not it has snow removal work to do, possibly in conjunction with wireless Internet access in order for it to receive local weather reports. The system would also need to be highly durable, and completely water proof because of the rough outdoor conditions it would endure. Ideally the unit would be affordably priced, similar to robot vacuums. And finally, the robot would need a very easy to use interface for its owners to use to show it where their driveway, sidewalk, and front walk are. An autonomous snow romoval system which requires no intervention by the user other than an initial programming of the user's property boundaries. The winning team should provide proof of thorough safety testing. The system should be waterproof and extraordinarily resilient to the harsh conditions it will endure. The device should ideally cost $500 or less.